To Upcycle or not to Upcycle. That is the question. I’ll admit when I go thrifting I am attracted to certain items, but not for the reasons you may think. Sure everyone dreams about finding the picture frame with a copy of the original US constitution in it resulting in the big “pay day”, but I am not always in it for what something is worth. I still have a lot to learn when it comes to determining what has the most value. More often than not, my choices are simply based on what I like. I love anything retro, furniture, and fabric. I love to think outside the box when it comes to how I utilize these materials. When I got the chair home, I did a little internet research on it and the company that made the chair. 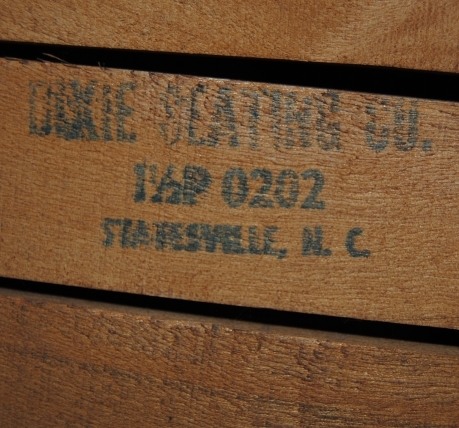 The Dixie Seating Company was founded in 1930’s and are known for making quality chairs and furniture for kids and adults. Most of these chairs are going for $76-$200 per chair online! I paid $5.99. Except for some minor wear, the chair is in excellent condition. After taking this all into consideration, I have put away the primer and I am instead taking out the Murphy’s oil soap. I am rethinking the upcycle and my decision is to leave the chair in it’s original state. What do you think? Have you ever decided not to upcycle an item because you were concerned a redesign could effect value? I would love to hear what others think on this. Do you all think I made the right decision? I e-mailed the company to try to gain more info on the chair including when the chair was made. They have not have responded. The company started in 1934, but has changed owners a few times, and they had no information on this serial #. They said best guess early 50’s. I believe the chair is at least 30 years old. If anyone out there can offer any additional info on this chair, I would greatly appreciate and would love to hear from you! Though I do not know the value of the chair, I think that you made the right decision. Though I love painting old furniture, I do leave certain pieces alone because the look of old furniture with its worn wood is also appealing (sometimes). I agree totally! Thanks for sharing! Right decision. Upcycling can just be about giving that old piece a new lease of life. so a good clean is the best way to go. I have got stuff, dipped and striped it of paint, sanded and varnished and its done and it is beautiful! I think that is what I would like to do with this too. I am just not used to coming across something like this, and I just didn’t feel right painting it. I think it would be better to restore or even just leave as is for now until I can find out more. I heard from the company today and they guessed early 1950’s but their is no official record on this chair because the company changed hands many times. How cool is that! I would leave it. Can always dress up with a cushion. I guess it depends what you are planning to do with it. Are you going to sell it? Then just clean it up. Are you going to gift it to someone who has a kid and will be using it as intended? Then I would probably paint it. When we were kids my grandmother had several of these chairs, painted all different colors. We loved them, and used them hard, and they survived it all. They are well made. I guess it is all about what your expectations are. If you are looking for best value, don’t paint it. But if you did not buy it for its value, but its possibilities, you might want to have fun with it. 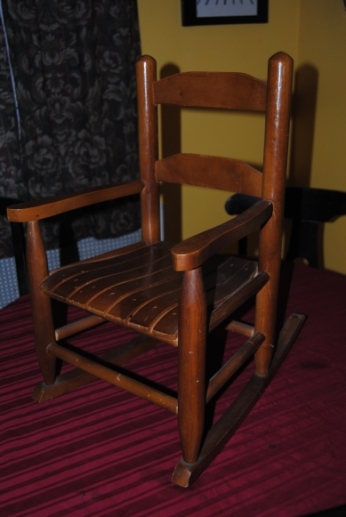 I was born in 1955 and received one of these rockers on my first birthday from my grandparents (along with my other 22 cousins who all received one as well), mine was lost in a house fire in 1970. These chairs retail for about $100. My cousin Bobbi Ann recently came upon one in a antique/junk store and purchased it for me as a gift. 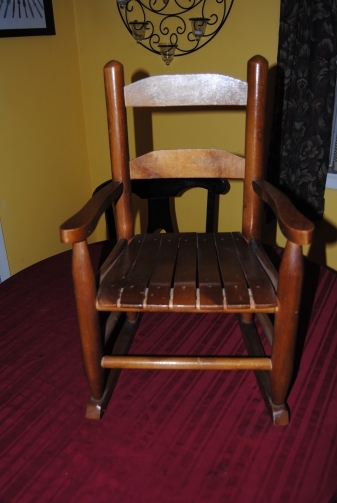 I’m thrilled to have “my rocker” again, it took me back in time and flooded me with so many good memories. Every time I look at it I smile !